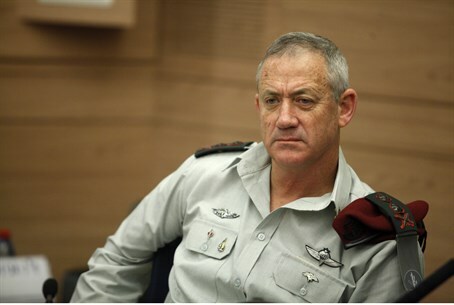 IDF Chief of Staff Benny Gantz holds the Lebanese Army directly responsible for Sunday's rocket attacks on Israel, Maariv reported Tuesday. "Occasionally we get a kinetic reminder of our environment, which reminds us of the need to be alert and ready for any action necessary as such," Gantz stated. 5 rockets were fired at Israel Sunday morning, but only one hit Israeli soil. The rocket hit an open field near the city of Kiryat Shmona; no injuries were reported. In response, the IDF shelled targets in Lebanon, aiming to eliminate the source of the rocket fire. It is unclear who fired the rockets, though both Palestinian terrorist groups in Lebanon and Hezbollah have been suspected to be the culprit. The IDF, Prime Minister Binyamin Netanyahu, and Defense Minister Moshe Yaalon warned Lebanon to monitor its own citizens carefully following the attack. Gantz opined that the Katyusha fire into northern Israel did not signal an escalation of tensions on the northern border - but did hold the Lebanese Army responsible for the attack. "The incident on the Lebanese border yesterday - a Katyusha that fell into an open field only by chance and was launched from an area controlled exclusively by the Lebanese army and the Lebanese government - does not indicate a new trend in the north, but did remind us that our security challenges have not disappeared," he stated. "We must always be prepared, and our neighbors are required to be held responsible," Gantz continued. He explained that in the event that Lebanon does not take responsibility for the attack, that "in the end, we will have to act and it will not be simple." Earlier this month, tensions rose between Israel and Lebanon after a Lebanese army soldier shot and killed 31 year-old IDF Master Sergeant Shlomi Cohen. The attacker eventually turned himself in to Lebanese authorities, and will be placed on trial there over the incident, according to Yaalon. On Monday, Israel filed a formal complaint to the UN over both the rocket fire and Cohen's murder.